We smoked the lamb at low temperature with a mixture of hickory, mesquite, and apple simply to add smoke flavor prior to making the filling for the pie. Preheat your smoker to 150°F. 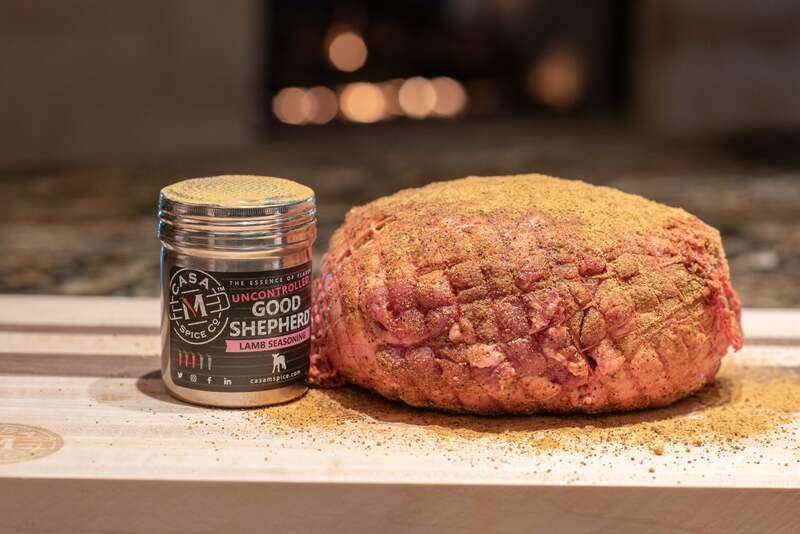 Sprinkle the lamb with salt at about 1/4 teaspoon of table salt per pound of lamb, then rub well with Casa M Spice Co™ Good Shepherd™ or Uncontrolled Good Shepherd™. Allow the lamb to smoke for 2 hours, then remove from the smoke bath and dice into bite-sized pieces. Heat 1 Tablespoon of olive oil in a large, thick-bottomed pan over medium-high heat. Add 1/2 of the lamb and brown evenly, roughly 5 minutes, then remove to a plate. Add another 1 Tablespoon of olive oil to the pan and repeat with the other half of the lamb and remove to a plate. Heat remaining oil in the pan over medium-high heat. Add garlic and onions. Cook for about 3 minutes stirring frequently. Add potatoes, carrots, and celery and cook for about 5 minutes, until everything is lightly browned. Add tomato paste, lamb stock concentrate, and beef broth and mix thoroughly. Add the lamb and Worcestershire sauce to the pan and mix, then bring to a boil and reduce heat to low. Simmer (covered) for about 2 hours, stirring every 30 minutes, until the lamb is tender and potatoes are cooked. 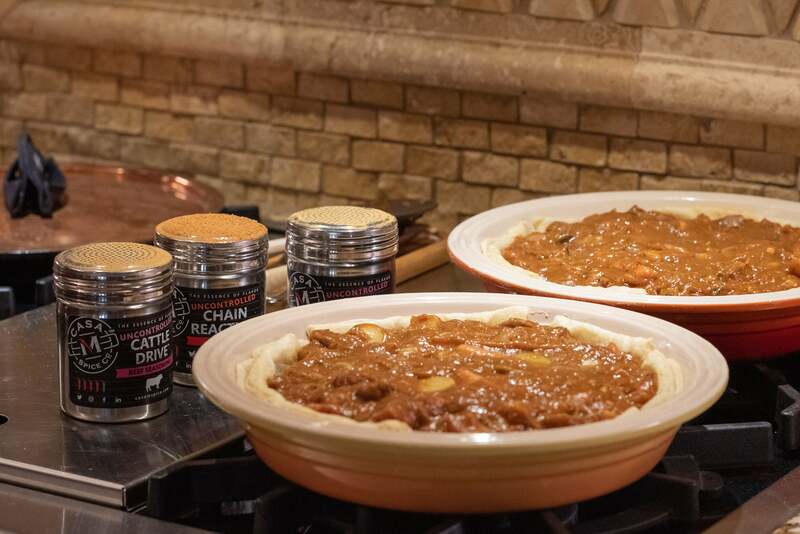 Taste the mixture and season to taste with Casa M Spice Co™ Cattle Drive™ or Uncontrolled Cattle Drive™, Casa M Spice Co™ Good Shepherd™ or Uncontrolled Good Shepherd™, and Casa M Spice Co™ Chain Reaction™. Add the corn starch to about 2 tablespoons of warm water and mix thoroughly, then add into the lamb filling, stir in thoroughly, and simmer for 1-2 minutes until the filling starts to thicken. Remove from the heat to cool. Lightly grease two pie pans and using the prepared puff pastry sheets, line the pans, trimming excess as needed. Line the pie pans with parchment paper and add ceramic pie weights or uncooked rice to weight it down, then blind bake for 10 minutes. Remove from the oven and let cool, then carefully remove the parchment paper and whatever you used to weight the pastry down. Divide the lamb filling between the two pie pans, then top with a sheet of puff pastry dough and trim as needed, pinching together the edges to seal the pie well. Prick the top of the pies with a fork to allow steam to escape. 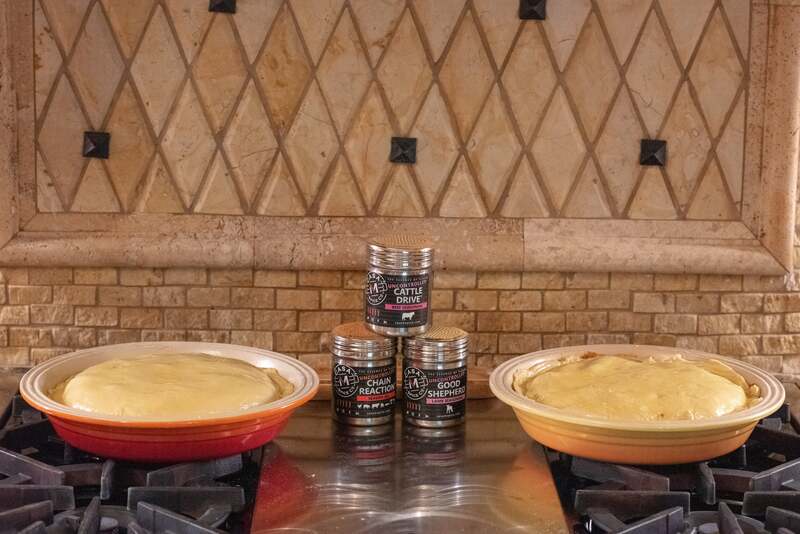 Brush the top of each pie well with the beaten egg wash.
To catch potential leaks, place each pie onto a baking sheet, then place into the oven and bake for 25-30 minutes, turning and swapping position on the racks at 15 minutes. Bake until the pastry is golden and crispy. Remove from the oven and let stand for at least 10 minutes before cutting and serving.